The "One Lake" proposal has hit another major hurdle. A report commissioned as part of the project's draft study has found the project poses serious public and environmental health risks. Photo by Imani Khayyam. JACKSON  The "One Lake" proposal has hit another major hurdle. A report commissioned as part of the project's draft study has found the project poses serious public and environmental health risks. "Groundwater samples collected from the two unpermitted landfill sites have revealed concentrations of toxic PAHs and heavy metals that are well above acceptable regulatory standards," said Abby Braman, Executive Director of Pearl Riverkeeper. "We suspect these alarming findings are only the tip of the iceberg since many of the sites have not been extensively evaluated, and much of the sampling done to-date has been very limited. Protecting public health should be the priority, not personal profit." Property contaminated by Gulf States Creosote, a former wood treatment facility, is owned by Fairgrounds Development Company, LLC. 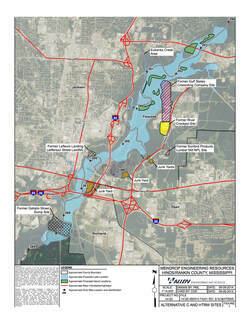 (View the Secretary of State 2018 LLC filing report) John McGowan, the company's registered agent, is a local businessman and decades-long promoter of damming and dredging the Pearl River in order to create new developable waterfront property along with questionable flood control benefits for metro Jackson. One Lake is the current iteration. "The inadequacy of One Lake's draft study continues to defy logic," said Jill Mastrototaro, Policy Director for Audubon Mississippi. "It downplays serious public and environmental health threats posed by these contaminated sites, it offers few details on site cleanup, and it provides no plan to ensure that the health of Mississippians and our wildlife is adequately protected." Twelve downriver stakeholders municipalities, including the Mississippi Commission on Marine Resources and the Louisiana State Legislature, have passed resolutions opposing the proposal. State and federal agencies continue to raise major questions about and objections to One Lake. For example, the Mississippi Department of Transportation found it would result in "catastrophic failure" of critical infrastructure, resulting in the replacement of nine bridges that would add nearly $110 million to the cost of the project. Mississippi Congressman Bennie G. Thompson (D-02), whose District the project resides in and would allegedly benefit, has called for, "The One Lake proposal [to] be rejected because it imposes unacceptable risks to the health, safety, and welfare of the public, including my constituents.